The paper aims to identify potential impacts of anticipated changes in climate on food safety and their control at all stages of the food chain. The purpose is to raise awareness of the issue and to facilitate international cooperation in better understanding the changing food safety situation and in developing and implementing strategies to address them. 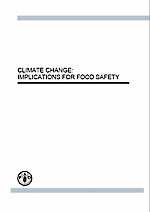 While this paper takes a broad look at a number of food safety issues and considers possible implications of climate change – it does not provide exhaustive treatment of the topic. The food safety issues covered include: agents of food-borne disease with specific consideration of zoonotic diseases, mycotoxin contamination, biotoxins in fishery products and environmental contaminants with significance to the food chain. The paper also highlights the need for adequate attention to food safety in ensuring preparedness for effective management of emergency situations arising from extreme weather events. There is much uncertainty about possible food safety implications of climate change. This paper discusses some expected effects that are supported by data; it also considers other issues that are largely speculative. The designations employed and the presentation of material in this information product do not imply the expression of any opinion whatsoever on the part of the Food and Agriculture Organization of the United Nations concerning the legal or development status of any country, territory, city or area or of its authorities, or concerning the delimitation of its frontiers or boundaries. The mention or omission of specific companies, their products or brand names does not imply any endorsement or judgement by the Food and Agriculture Organization of the United Nations. This paper was prepared with contributions from: Lee-Ann Jaykus, Marion Woolridge, J. Michael Frank, Marina Miraglia, Abigail McQuatters-Gollop, Cristina Tirado – FAO consultants Renata Clarke and Mary Friel – Food Quality and Standards Service, Nutrition and Consumer Protection Division, FAO The positions and opinions presented are those of the authors alone, and are not intended to represent the views of FAO.